Michael Sheng (#5) and Jack O’Connor (#4) both scored double digit points for Emerson on Wednesday night. Emerson led for most of the game, but Tufts rode a strong performance by Vincent Pace, who scored 30 points, to the win. Pace made a key three-pointer to tie the game at 67 with 1:36 to play. Pace then drove to the basket out of a Tufts timeout to give the Jumbos a 69-67 lead. Down two with 23 seconds to play, Emerson began fouling Tufts players, and the strategy nearly paid off. Jumbos guard Everett Dayton made just one of his free throws, keeping it a one possession game at 70-67. After a timeout, Emerson had a chance to tie, but sophomore guard Jack O’Connor missed a three. Emerson again fouled immediately, and this time Pace missed both of his free throws. Tufts then fouled O’Connor, who went to the line but missed the first free throw. His attempt at an intentional miss to set up a last-ditch three-point play resulted in a whistle because the ball didn’t contact the rim. Tufts (5-3) dribbled out the final seconds to secure the victory. Head coach Bill Curley and the basketball team did not answer questions on the record after the game. Tufts started strong, taking a 6-2 lead, but a corner three from Emerson’s Geoff Gray and nice drive in the post by Mac Sashin put the Lions up 7-6 and swung the early momentum in their direction. Emerson converted over 62 percent of field goals in the first half en route to a 16-point halftime lead, its largest of the game. The Lions also performed well in the paint, outscoring Tufts 16-12 in the first half down low. Emerson centers Will Lantier and Mac Sashin combined for eight points. Tufts’ ability to control the offensive boards made the difference in the second half. The Jumbos outscored Emerson 15-6 on second-chance opportunities. Emerson also shot just over 26 percent from the field in the second half, while Tufts made 50 percent of its field goals. Gray scored 19 points to lead the Lions, and added 14 rebounds for a double double. Michael Sheng (13 points) and O’Connor (10 points) also finished in double digits on the scoreboard. Emerson beat Tufts in 2013 at home, but has dropped its last four meetings against the Jumbos. 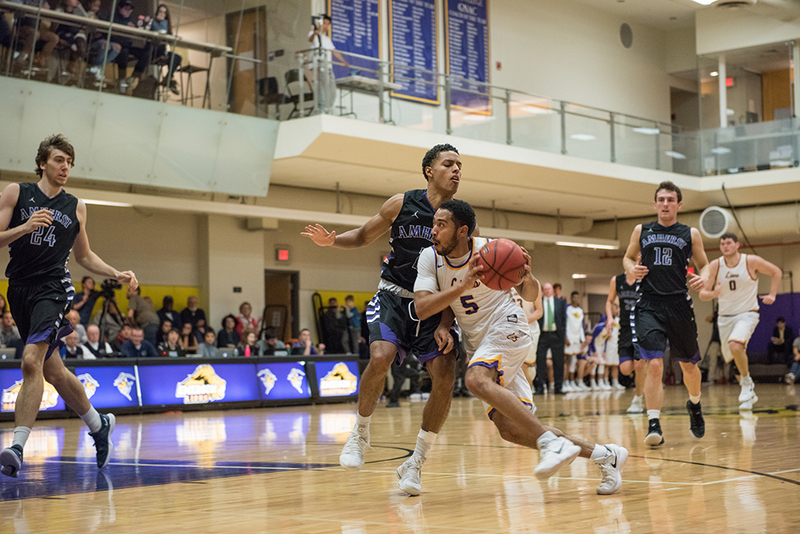 The Lions (5-3) travel to Curry College for a 3 p.m. tip on Saturday.